Sorry so late on this reply. I have a 512 MB RAM chip and a 256 MB RAM chip in the ol' sage octopus, giving me a total of 768 MB. I suppose I should try to pick up another 512 MB and have 1 GB of RAM, but the Pismo I have has 384 MB and seems to run Tiger 10.4.10 okay. Do you have any experience with Wegener? Wegener has a processor exchange for about $200, if you send them the old board. No problem to take it out, Pismos are way easy to take apart. Thanks for sharing the data. Getting past 512 MB really seems to unleash Tiger in my experience - and for a power user like me (17 apps open at present plus Classic Mode), more is even better. I bought my used G4/1 GHz dual with 768 MB, which was okay, but adding another gig of RAM made it fly. I've purchased from Wegener in the past and been satisifed, but I have no experience with their G4 upgrade for Pismo. Great site! I've using it for years to help me with my older Macs. I just wanted to pass on some information to Peter about AOL on Mac. The last version AOL made for classic OS was 5.0. It used Internet Explorer 4.5 which cannot display modern websites correctly. If they were to upgrade their iMac to [OS X] 10.1 or above, they'd be able to use AOL for OS X. This is a major improvement over 5.0 and uses the Gecko rendering engine from Netscape. They would have no problem going to websites with AOL for OS X (or any of the other browsers available for OS X). I sent this to Charles Moore, but since you've been writing about white iBook problems, I thought I'd send it to you as well. There is a company called First Phase Technologies in Tempe, AZ (USA) that does board-level electronic repairs. Specifically, they do re-flow and re-balling of the video chip on white iBooks for a very reasonable fee. There was a lister on the LEM Swap List who offered two iBooks for sale recently who had this repair done to both units; he seemed very happy with the results. This is how I heard of the company (I have had no personal dealings with them, and I am not affiliated with them in any way). You might wish to pass this along to your readers. Getting an otherwise working iBook back up to speed for a reasonable cost (especially if they can do the logic board removal themselves) might be worth the investment. This might be old news, but I haven't found much about it on Google. So I thought that I'd give something back for the great contents you have. The positive: It's dead silent. No moving parts, no fan. USB sticks are cheap, and get cheaper and bigger all the time. (1 gig is cheap, 16 gig is not too expensive either.) It's extremely easy to replace. The USB stick can be used with your new Mac as well. The only sacrifice is the space for OS 9. The negative: It's quite slow, as you might expect. I haven't run it for a long time, so I don't know if there will be stability issues (yet). But I thought it could be a good thing to post for people who have an old clamshell iMac, and want a completely silent (but a bit slow) machine. Thanks for sharing your findings. I can hardly imagine how slow this must be, as USB 1.1 is slower than a 6x CD-ROM, but I'm glad you've found a way to make the old iBook work. Too bad your iBook doesn't have FireWire - it's about 50x faster than USB 1.1. For more speed, one alternative would be to put a Compact Flash drive inside the iBook using an adapter. That would greatly increase speed and eliminate the need for a device hanging out of the USB port. See Silence Is Golden: Running Your Existing Notebook Using Flash Memory. The easiest way I've found to get Google to spider a web site is to purchase a Google AdWords advertisement for a few days. Watch your server's log for the Googlebot spider. It'll appear immediately after you place the AdWords ad. Your AdWords ad should appear on the sidebar when you search for the keyword(s) of your AdWords ad. This should happen quickly. The no cost alternative is to link to the new web page from a page that Google is already spidering regularly. Google AdWords ads don't cost much, especially since you'll only be needing it for a very short time. If nobody clicks on your ad, it will cost you nothing. Many thanks for the info on hard drive partitioning on tray-loading iMacs for OS X. Another question, based on another reader's experience putting a Western Digital 7200 RPM drive in his iMac 500 mhz, which I think is convection-cooled: Are the new 7200 RPM drives so much cooler-running than the old ones that they will work in iMacs without driving internal temperatures up? I have a three-year-old Hitachi 7200 RPM 60 gig drive in this iMac, and, left on too long and/or with intensive drive access, it gets the temperature (as reported by Metronome, a Sonnet software temperature gauge) up past 55° C, which I think is too high for comfort. If a 7200 RPM drive in a convection-cooled iMac doesn't broil the CPU, it would seem that one would be okay in an iMac that, like the one I presently use, has fan cooling. What are your thoughts on this? Also, is anyone out there still selling 5400 RPM drives? Thanks, and Low End Mac ROCKS! Hard drives are the most likely part of a computer to fail. Part of the reason for this is that they have moving parts, and another part is that they get warm. I haven't been able to find any consensus on that maximum safe temperature for a hard drive - some sites set it as low as 40°C, most at 50-55°, and a few say 60°. Everything else inside your computer is rated for higher temperatures, but 60°C is beyond prudent safety limits. I've just downloaded Temperature Monitor and installed it on my Power Mac. It reports that one drive is 35.0°, the other 43.0°, and the CPU a warm 58.2°. In the past I've put 7200 rpm drives in small aluminum enclosures, and I discovered that they tended to build heat to the point of failure. Not good, but fortunately something that in most cases can be fixed by letting the drive cool to room temperature and putting it in a better enclosure. (I'm a big fan of the NewerTech miniStack.) In my MDD Power Mac, I ended up putting each hard drive in a different part of the computer to avoid the heat buildup from two 7200 rpm drives right next to each other. Some drives run cooler than others, and 7200 rpm drives run hotter than 5400 rpm. According to a hard drive roundup at Hardware Analysis dot com, in a well ventilated environment 5400 rpm drives run 15.1-17.5°C above room temperature while 7200 rpm drives run 18.0-22.0° degrees above ambient. A typical 70°F room is 21°C, putting 5400 rpm drives in the 36-39°C range - very safe. A 7200 rpm drive should be in the 39-43°C range, also safe by any reasonable estimate. All things being equal, a 7200 rpm drive will run 3-4°C hotter on average than a 5400 rpm drive - enough to reduce reliability by about one-third. Western Digital drives are considered some of the coolest running, so they may be a good starting point. 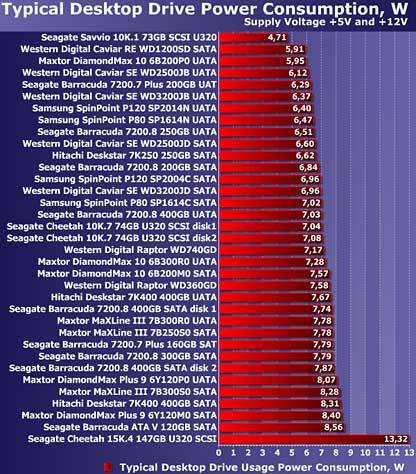 Maxtor 7200 rpm drives, which I've had bad luck with, were the hottest in this test. HDD Diet: Power Consumption and Heat Dissipation has an in-depth overview of the subject and raises the point that heat is related to power consumption. The more power the drive needs to spin, the hotter it will get. All else being equal, pick the drive with lower power consumption if you're concerned about heat buildup. In the end, I can't say whether a 7200 rpm drive will run too hot in your iMac. As long as it's kept in a cool environment, has good air circulation, and you choose a lower power draw drive, you'll probably be okay.